Somewhere around the third book in a series, things start to grow comfortable for both the author and the reader. Authors know that they have a loyal audience and have a sense of what it is they are trying to accomplish with the novels. Readers, on the other hand, come to trust the author and to love the characters enough to let go of any worry – it becomes more about the journey and less about the destination. 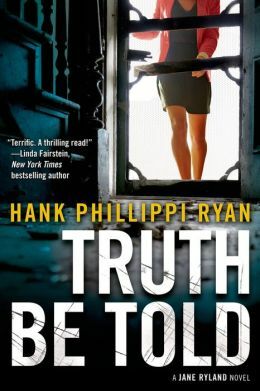 Truth Be Told is the third book in Hank Phillippi Ryan’s Jane Ryland series and while there is little doubt that readers have always been in very capable hands, this book cements the ideal of what a Hank Phillippi Ryan novel is. Jane Ryland is a character that readers can root for. She is a stand-up individual in a tough industry. Journalists today do not have an easy job and as we see Jane surrounded by some less savory characters, we begin to realize how special she is. But because Hank strives to make Jane a real person, she is also not without flaws. She makes mistakes and gets things wrong sometimes – even in her personal life. Throughout Truth Be Told, readers watch how she and Jake Brogan misinterpret actions and fail to communicate in a succinct manner, resulting in some dysfunction in their already challenging relationship. Poor communication is not a problem for Hank Phillippi Ryan, however. Like previous books in the series, Truth Be Told features multiple storylines, numerous points-of-view, and unusual (yet realistic) twists. Experiencing how Ryan weaves these plotlines together is like watching a boatswain’s mate execute a sequence of complex knots – both manage it with skill and panache. In this novel, there are three major story threads. Jane is working on a series of articles on foreclosed homes, as well as dealing with the discovery of a dead body in one of the properties. Jake is faced with what he believes is a false confession to a twenty-year-old case; a case that has ties to his own family history. And finally, there are the banking employees, some of whom are doing the right thing and some whom are not – the problem lies in telling one from the other. Never one to take the easy way out, Ryan also includes many other short-term storylines which at first may seem to be tangents, but often end up uniting the disparate concepts into an effective whole. Hank Phillippi Ryan is a master at pacing. Through the use of short chapters and cliffhanger endings, she is able to keep readers glued to the page, anxious to know what is going to happen next. Major reveals occur just as the reader begins to think they have it all figured out, throwing things into a complete tailspin. Once you begin Truth Be Told, don’t expect to get much sleep until you have reached the end. And oh, what an ending it is! Hank Phillippi Ryan has been quoted as saying that when she figured out how to wrap-up Truth Be Told, she stood up and clapped – likely because she was both proud and relieved that she was able to craft a convincing ending to such a complex story. Believe me when I say, many readers will be clapping and cheering as well. Three books in and the Jane Ryland series just continues to get better. The second book, The Wrong Girl, has won multiple awards (and that number continues to grow). Readers can expect to see the name Hank Phillippi Ryan and Truth Be Told on similar nominee lists again next year. If you haven’t yet met Jane and Jake, now is the time. _____________________________________________________________________ Disclaimer: A print galley of this title was provided to BOLO Books by the author (at BookExpo America). No review was promised and the above is an unbiased review of the novel. I really must read something by Ryan already. Saw her moderate a panel earlier this year and enjoyed her very much. Start with The Other Woman, Chris. It really is a great first in a series. And yes, Hank is a great moderator.